It was back in June last year that Dr. Shaun Herness got in touch with me with an unanticipated request. I get many emails asking for information and opinions related to Loch Ness and its monster but Shaun's request was unique in asking for me to take him on a personal guided tour of Loch Ness. He had decided to embark on a “bucket list” tour of Europe and a visit to Scotland’s most famous loch was on the agenda. Shaun is an accomplished and well-spoken individual, but since he was a child, he has always had an interest in Loch Ness and its fabled monster yet had never been to Scotland, never mind the loch. Now the time had come as his brother, Dr. Ivan Rusilko, wanted to do something special for him and a trip to Scotland and Ireland was organised and planned which not only included Loch Ness but a visit to the birthplace of the Titanic at Harland & Wolff shipyard in Belfast and the world renowned cliffs of Moher on the west coast of Ireland. Tours of Loch Ness are abundant being that it is such a tourist “hotspot.” There are a variety of boat cruises up and down the loch, tour vehicles transporting people around to the various towns and village that surround the loch, and then there are the in-house tours at Castle Urquhart and other various local exhibitions and exhibits. Having said that, these tours are pretty standard in format and don't diverge much from the pre-written script. In other words, it is often entry level information for entry level tourists. There is nothing wrong with any of these tours as they more or less satisfy what most visitors to the loch want and desire. But what if you want a more informative experience about the history of the loch and its most famous inhabitant by someone with local knowledge and expertise? You could participate in some tours which are heavily biased towards dissuading belief in a large, unknown creature in the loch and even then it may only last an hour or so as the guides quickly usher you through the exhibition in anticipation of the next batch of tourists. Or one could opt for something more substantive. In that light, I asked Shaun what he wanted to do and see and from that we tailored an individual tour of the loch's most famous attractions and monster “hotspots” which lasted not one hour but a whole working day! Having agreed on a rate of compensation and Shaun having kindly paid for my night’s stay at a local hotel, on a recent Saturday evening I met him and Ivan at the Inverness rail station and from there we proceeded to dinner. Although the tour did not officially start until Sunday morning, even the drive to the lochside hotel from Inverness had some buzz to it as we talked over the famous Arthur Grant land sighting which also occurred at night along the stretch of road on which we were driving. After a couple of drinks at the hotel lounge and more talk of loch folklore, it was off to bed wondering if during tomorrow’s “big day” Nessie might put in a surprise guest appearance! In the morning after breakfast it was off around the loch. The weather was overcast with a bit of mist and slight rain providing an aura of mystery and suspense to the day’s events! Ivan and his girlfriend, Melitsa aka “Checkers” decided to embark on a fishing excursion on the loch and so at 9:00 AM we began our trek and headed south on A82. As befitted a personal tour, an hourly itinerary had been drawn up along with appropriate visual aids. We started with the aforementioned Arthur Grant story. 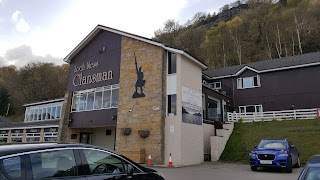 We were staying at the Clansman Hotel, for near there is where it likely happened, and not more than a mile up the road at Abriachan. After a short walk up the lochside to the alleged location of the Grant sighting it was then into the car and onto Drumnadrochit as I talked through various famous events in the rich history of Nessie tapestry as we motored along in my car. Now as you may know, there have not been any sightings of the creature in Drumnadrochit and by that I mean any strange animals observed going down the river to the loch. Of course, the loch is a fair way off from the town centre. The two exhibitions centres located in Drumnadrochit did not figure highly on my suggested itinerary and Shaun agreed - onto the castle. Parking at Urquhart Castle afforded a superb view of the loch and the opportunity to explain some spots of interest beginning with the late Winifred Cary and her record 17 sightings as I pointed out her former home above the castle. That led us down a paranormal side street as the famous Ted Holiday "tornado" and "man in black" were discussed. I pointed to the stretch of road where Holiday may have met this mysterious person. Naturally at this spot the famous Peter MacNab photograph of 1955 was discussed. But where was he standing at the time? Some so called experts have got it wrong but that is story for another day. So many things have happened in this area that there was not enough time to discuss all of them so we headed into the castle complex. Unfortunately, we headed to the ruins just as a Jacobite cruiser was disembarking its tourist contents and it became a game of dodgems along the narrow paths. I pointed out that Anthony "Doc" Shiels allegedly took his famous 1977 photo from the top of the castle tower, but amongst the throng of tourists we were not sufficiently convinced to trudge up the spiral steps for the view. After that it was onwards to a triple sightings spot at the Alltsigh Burn - Wilson, McLean and Cruickshank. 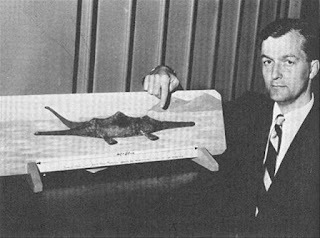 Now Dr. Kenneth Wilson is a controversial figure and his famous Surgeon's Photograph will forever be the iconic monster image. Whether you believe his account or not, he communicated enough information to place the sighting close to the aforementioned river. McLean and Cruickshank were even more precise and one could almost literally stand where they were when the “water horses” they described appeared within close proximity. Pictures were taken, and we moved on. After another short stop at the next town of Invermoriston, it was onto the Horseshoe Scree and the famous “A-list” land sighting of Torquil MacLeod in 1960. The impressive sight of the huge scree connected more with MacLeod's monster as the two are linked together in his account from 58 years ago. I explained to Shaun theories regarding the sighting, such as goats congregating on the steep slope of the scree as it descended down toward the loch, though I had my doubts. It was then a short drive to the site of the MacGruer land sighting of 1919. As I had just published my recent book on famous land sightings, Shaun was interested in seeing the locations where these events allegedly occurred. The MacGruer sighting was a strange event, something not quite monster but not quite anything else. As we looked over the shadowy, eerie waters of Inchnacardoch Bay with its several moored boats, dilapidated shore-stranded wreck, and the lonely, secluded Cherry Island, the only island on loch waters, I wondered if it was a juvenile creature that was seen by the children almost 100 years ago in this vicinity. It was then onto Fort Augustus. We enjoyed a lunch at the Boat House Restaurant and briefly looked the town over with emphasis on the locks of the Caledonian Canal, but Alex Campbell was the main attraction as we headed to his former house in the old part of the town away from the tourist tumult. Campbell's first sighting was in September 1933 from his house and it was from there that a reconstruction of his account was attempted. One thing that struck us was the distance which made the suggestion that he saw cormorants a bit unrealistic as it would have been a bit of a struggle to see such birds in any specific detail that far away. I don't know who owns his house now as I believe his surviving wife, Mary, passed away years ago. It was back into the car and time to start heading for the quieter, southern shore of the loch. But just before we turned north, the site of the Margaret Munro land sighting beckoned us to stop. The house from where Margaret Munro saw a huge creature, known as Kilchumein Lodge, was pointed out. One was tempted to knock on the door and ask the current owners if we could go to the likely window where she made her famous sighting and look out. In fact, perhaps the current occupants don't even know about the famous event that occurred in 1934 from an upstairs window in their home! After walking the beach of Borlum Bay and pointing out the spot where the creature seen by Margaret Munro lounged onshore near a burn, it was off to the southern side of the loch. The road suddenly rises steeply as a magnificent view of the loch opens up to the left. Eventually the high point of the Suidhe Viewpoint at 1,200 feet high is reached. The loch is well out of view at this point and it was now a drive through Highland countryside for some miles before the turn off for the lochside village of Foyers. What followed is a series of winding and sharp bends for a few miles as one must pay particular attention to traffic coming in the opposite direction. The river Foyers flows alongside the road to the left and I pointed out that it was somewhere along this road that Lt. Col. Fordyce had his extraordinary encounter with something we cannot quite explain even in “traditional” monster terms. Eventually we arrived at Foyers and parked at the Waterfall Cafe. At this point it was time to discuss the famous Tim Dinsdale film of April 1960. As we stood nearby and I pointed out where the creature ploughed its furrow through the loch, Shaun was surprised at the extreme distance the actual filming of the event occurred and I agreed. At nearly a mile away, it was no surprise that the object in the film is no more than a dark spot. Indeed, if Tim had only taken some still pictures of this mile away object, would Tim just become another Nessie tourist with interesting photos and would expeditions such as the Loch Ness Investigation Bureau (LNIB) or the Academy of Applied Science (AAS) have ever happened? It is curious how enquiries and investigations can turn on certain events. The view itself is now severely hampered by nearly 60 years of tree growth. After initial observation, we discussed what Dinsdale did next. As the tale goes, Tim was nearly out of film and made the decision to high tail it down the road to the shoreline in the expectation of a head and neck putting in an appearance. We then retraced that mad dash down the road, but at a more subdued, leisurely, and safe pace. Where Tim exactly got out and ran to the loch is not clear, but it was likely somewhere near the current Loch Ness Shores campsite. We parked up near the Foyers Cemetery as the end of the Tim Dinsdale segment dovetailed nicely into the location of the Hugh Gray photograph of November 1933, the first of the alleged creature. Hugh Gray did not precisely state his location in the original account, but Dinsdale and Holiday provide enough information to place it near the memorial to Jane Fraser who died in 1817. There has been 85 years of tree growth since Hugh Gray snapped the famous picture of Nessie and so the view is more obscured but enough to look down, as he did, and imagine that strange creature he saw on a winter's day on the surface of the loch. From there it was back onto the main road and the continued journey towards Dores. I pointed out where Dinsdale had stayed during his famous week at the loch. The loch came back into view as we headed towards Boleskine House and its attendant graveyard where necromancers were once claimed to practise their dark arts. It was at this point that I offered Shaun the option of parking and heading down the hillside towards the site of the Peter O' Connor 1960 photograph. Having described the clambering and sliding involved, not surprisingly he declined and we continued our journey. After a few miles we entered the real domain of monster land sightings, or "Monster Alley" as I call it. That stretch of road between Inverfarigaig and Dores that has had a disproportionately high number of land sightings over the decades. Of course, the odds of Shaun and myself seeing a 30 foot aquatic leviathan hauling itself across the road in front of us was still a very remote prospect, but we headed to the spot of two famous accounts, Lachlan Stuart and George Spicer. Now according to the sightings map in Rupert T. Gould's 1934 seminal book, "The Loch Ness Monster and Others,” the location of the July 1933 Spicer’s event is very close to the spot where Lachlan Stuart took his July 1951 photograph. However, Gould was not entirely clear on the exact location and I have made my own attempt to place the location of the Spicer’s sighting. For the purposes of our tour, however, we used the Gould map sighting location. There is an extended parking lay by at the Stuart-Spicer site, which was convenient and we walked to the top of the old stone steps above the beach where Stuart and Hay ran down from the croft to snap the photo of the appearance of three strange humps on the loch which has stirred debate and controversy ever since. We discussed hay bales and tarpaulins and I provided my thoughts on that theory but we did not venture further down to the beach. Back on the roadside, we walked a short distance to where George Spicer's alleged 25 foot monster may have moved across the road in a series of undulating jerking motions toward the loch. We pondered the dynamics of a huge creature getting from the hillside to our right and down to the loch below on our left in what was described as such an expeditious manner. There was one more classic Loch Ness Monster site to visit and that was the Greta Finlay account of August 1952. There were two ways of getting to the pier by Aldourie Castle, the scenic route walking around Tor Point or driving much closer to the location with a five minute woodland walk used by local dog walkers. I chose the latter and we were soon back at the top end of the loch before it joined to Loch Dochfour. One wondered where Greta's caravan was parked. I made a few guesses as to its location and on which side of the pier the creature showed itself to the petrified woman and her son. One thing seemed certain, how someone could mistake a deer for Nessie at such close proximity at this location was beyond me. And so the tour came to an end! It was about 7:00 PM. It had been a tiring but rewarding day and Shaun had finally checked-off one of his “bucket list” items. It had been a tour with an itinerary arranged and organised by him with my guidance and assistance. It was a pleasure to meet Shaun and his brother Ivan and Ivan’s girlfriend Melitsa. Special thanks to Ivan for organising Shaun’s European trip and making his tour of Loch Ness possible and for inviting me to dinner and drinks. If you plan on visiting Scotland and would like to embark on a similar tour exploring Loch Ness, its local attractions, and the history of its mysterious and most famous inhabitant, where, like Shaun, you decide what you want to see and where you want to go, please send me an enquiry to the email address below. Sounds like a great tour. Do you accept payment in ale? If I was hiring though, we'd be sliding down to the O'Connor spot and we would be going down to Stuart's beach. And what is going on at Boleskine since the fire? Boleskine is still a burnt out shell but it is still difficult to see from the road. One could turn it round and muse how could someone possibly mistake a deer for a large, unknown aquatic creature ? Ah yes, the cliffs of Moher are indeed spectacular [ on a clear day ] however to finance the overly large visitor centre an entrance fee is demanded which bugged me no end. We have the splendour of Glencoe, The Great Glen, The Trossachs, and other scenic vistas, all for nothing. The only alternative is state-susidised visitor centres. No need for the pub tour, we would have hopkarma's ale in abundance. Fellas, in keeping with the subject matter of this site I would advise that the ale is served in, ahem, longneck bottles! Could turn out to be a "staggering" tour at this rate. Is there even any hostelries on the south shore ? The Foyers Hotel [ Dinsdale's old haunt ] looked decidedly closed last time I passed by. There’s The Dores Inn - by far the best pub on the Loch. Whitebridge Hotel also good under the new owners. The local council are hopeless, and really drag their feet , one of Scotland's most universal icons and a bankable tourist cash cow and there's barely a penny spent on infrastructure, the south road is a disgrace, hardly changed since Wade was a lad. Roadside info markers would be a good idea, locations of famous sightings and photographs. Nice little side gig you got there Roland. Wish I could afford the trip and your services. You're West USA? Long way to come. Yes, both east and west with two large ponds between Scotland. Maybe one day. On my bucket list.